Early Stanley engines applied steam for nearly the full length of the stroke of the engine. The Stephenson Valve Gear of the engine was controlled by a foot pedal. Released, the engine propelled the car forward. By pushing the foot pedal to the floorboard and holding it there while opening the throttle the engine's valve action would be reversed and the engine would now propel the car in reverse. Unique to the steam engine is it's ability to run as fast in reverse as it can in the forward direction. It wasn't until after a few years of production that the ability to "hook up" a Stanley engine was incorporated into the design. As the steam engine picks up speed steam is being admitted to one side of the piston and then the other (thus the term "double-acting piston"). For maximum efficiency of the engine the exhaust needs to leave the cylinder as fast as possible in order to maintain maximum pressure differential across the piston (boiler pressure on one side of the piston and atmospheric pressure on the other side of the piston). As the early cars could not travel too fast due to the road conditions, exhausting the steam from the cylinders wasn't an issue. However as roads improved the cars could pick up speed and soon the steam engines were becoming "exhaust constricted". By becoming exhaust constricted or exhaust limited, the differential pressure across the piston decreased (thus making the engine less efficient) due to the exhaust steam not being vented from the cylinder and engine fast enough. Thus the functionality of a "Johnson Bar" as they are often called on locomotives, or more correctly engine hook-up was designed into the Stanley engine. The foot pedal that originally served only to reverse the car was modified to provide "hook up" for the engine. Hooking up a steam engine is also known as controlling the "cut-off" of the cylinder since "hooking up" a steam engine is effectively controlling when steam is "cut off" from entering the cylinder and pushing against the piston at boiler pressure. When a steam engine is operating "hooked up" it means that the steam is only being admitted to the cylinder for a small amount of time (or more correctly for a short distance of the stroke). 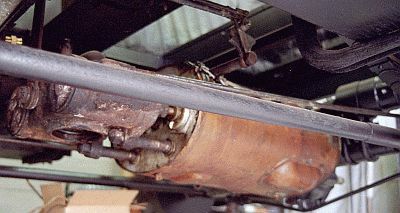 Thus with the hook-up pedal released, steam was admitted to the cylinder for most of the motion of the piston (generally steam was applied to the piston for about 80% of the piston's total travel). However, once the car reached about 15 MPH the hook-up was partly depressed until it latched. In latching the hook-up pedal at an intermediate position the Stephenson Valve Gear changed the steam admittance to the cylinder such that steam was admitted to the cylinder for approximately 20% of the piston's total travel. Hooking up or changing the engine's cut-off accomplished two major improvements to the engine's performance. First with less steam being admitted to the cylinder there was less to exhaust and thus the engine would no longer reach an exhaust limited stage of operation at higher speed. Secondly, by allowing the steam to expand in the cylinder (i.e. allow the pressure in the cylinder and on the piston to drop from boiler pressure to something less) used the expansive energy of the steam to propel the car as well as the direct boiler pressure. Some manufacturer's referred to the hook-up pedal as the "steam-saver" since engaging the steam-saver pedal effectively reduced the amount of steam admitted to the cylinder. Whether called a hook-up pedal or a steam-saver pedal, the result is the same and that is to reduce the amount of time steam is applied to the cylinder and piston thus using more of the expansive energy of the steam to propel the vehicle while also insuring at higher operating speeds the engine doesn't become exhaust constricted. For additional detailed photos and information on the Stanley engine see the Photos of the Stanley Engine section.